OTTAWA -- Canada's envoy to China faced criticism Wednesday for opining on how a Huawei executive might avoid extradition to the United States, fuelling speculation his remarks were a political ploy to end the government's diplomatic crisis with China. The candid remarks by John McCallum, Canada's ambassador to China, marked a radical departure from the Trudeau government's firm public line that the extradition proceedings of Meng Wanzhou are an independent -- and apolitical -- legal process that must be respected. Speaking to Chinese-language reporters Tuesday in the Toronto area, McCallum listed several arguments the legal team representing Huawei's chief financial officer can make in her defence. Meng was arrested Dec. 1 in Vancouver, at the request of United States authorities who alleged she used a Huawei subsidiary to evade sanctions against Iran. Topping McCallum's list was the possibility of political interference stemming from last month's comments by U.S. President Donald Trump that he might intervene in Meng's case if it would help him strike a trade deal with China. "I think she has some strong arguments that she can make before a judge," McCallum told Chinese-language reporters in Markham, Ont. Meng was released on bail and is to live with an ankle monitor and a curfew in her family's Vancouver mansion pending the extradition process. Erin O'Toole, the Conservative foreign affairs critic, said he believes McCallum's comments were approved by the Trudeau cabinet given they were his first public statements after briefing the Trudeau cabinet about the fallout from the Meng case at a cabinet retreat in Quebec last week. He said the only outcome he can see from McCallum's comments is that doubt has been raised for the case against Meng. "That's pretty bad form for a Canadian ambassador," he said. "I do think it was a political direction if you look at the timing of it." O'Toole noted McCallum didn't mention any of it when he briefed an all-party committee of MPs last Friday, the day after the cabinet briefing. Meng's arrest has left Canada politically wedged between China and the U.S., its two largest trading partners. The Canada-China relationship has plunged to new lows amid warnings from Beijing of serious consequences unless she is released. If a Canadian court rules against extraditing her to the U.S., it would take the political pressure off the Trudeau government because it would lessen the need for Justice Minister David Lametti, who has the final sign off on the extradition, to take any action that could be seen as contradictory to the will of the courts. "As criminal lawyers, we often say we've seen just about everything, well I haven't seen this before," said Ottawa lawyer Ian Carter, who represented Ottawa professor Hassan Diab in his controversial terrorism extradition case with France. 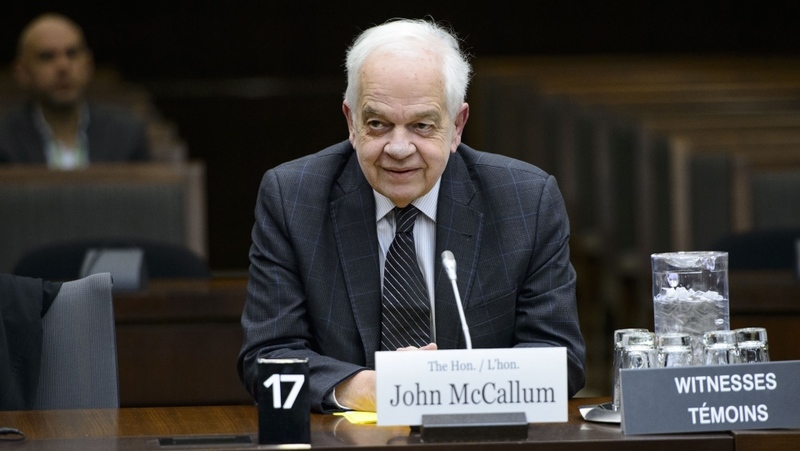 Prime Minister Justin Trudeau sidestepped questions about McCallum's comments, saying Meng will have the opportunity to "mount a strong defence." "We have always highlighted that Canada is a country of the rule of law, and we will make sure that the rule of law is properly and fully followed," Trudeau told reporters in Saskatchewan. David MacNaughton, Canada's ambassador to the United States, expressed no interest in weighing the merits of Meng's case. "That's a legal process. It's not a political process. It's not up to me to make that kind of a judgement," he told reporters in Washington. A spokesman for Foreign Affairs Minister Chrystia Freeland reiterated Canada's commitment to "conducting a fair, unbiased and transparent legal proceeding," and said there has been no political involvement in the execution of Canada's extradition treaty with the U.S.
Last month, after Trump's musing in a Reuters interview about intervening in the Meng case, Freeland travelled to Washington where she said such comments could prove useful to her defence. Canadian government officials who briefed journalists last month in Ottawa said the same thing. But Carter said McCallum's remarks went much further. "What's so different here is that this is a representative of the Canadian government that is essentially siding with the defence. It's just unprecedented," said Carter. Conservative Leader Andrew Scheer called on Trudeau to fire McCallum for the remarks. "As a spokesperson of the Government of Canada, Ambassador McCallum's comments raise grave concerns about the politicization of this case," Scheer said in a statement. "I call on Justin Trudeau to immediately clarify if Ambassador McCallum's comments reflect his government's position." In the days that followed Meng's arrest, China detained two Canadians, Michael Kovrig, a Canadian diplomat on leave, and Michael Spavor, an entrepreneur, on allegations of endangering China's national security. China also sentenced another Canadian, Robert Lloyd Schellenberg, to death in a sudden retrial of his drug-smuggling case. McCallum was addressing Chinese foreign correspondents in an event that was not promoted to Canadian journalists. He said he was aware the Meng case had personally upset Chinese President Xi Jinping but he didn't know exactly why. "Maybe it's because Huawei is a national flagship company of China," he said. "It's not just any company, it's a special Chinese company. So, maybe that is why he is so angry."